3. 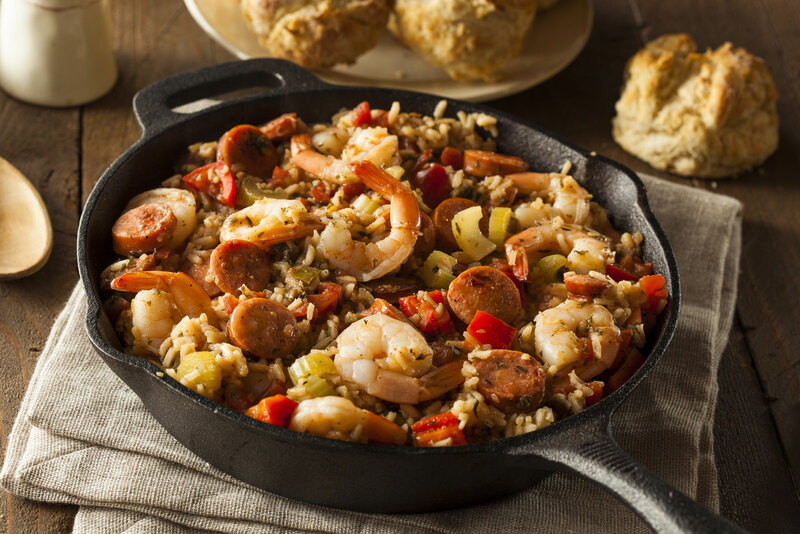 Jambalaya The Deep South version of a paella, this popular rice-based dish contains an assortment of meats including chicken, sausage and/or seafood, vegetables, and a generous amount of flavours and spices. The dish was born out of necessity in New Orleans because it is inexpensive and can be made using a bit of everything. There’s a debate about whether this hearty dish is Creole or Cajun, when in fact there are both versions, the main difference is the use of tomatoes (Creole with and Cajun without), but both include what is known as the ‘holy trinity’ – bell pepper, onion and celery. It is believed that its name comes from jambon, the French word for ham, and aya, the West African word for rice. Roll up your sleeves and loosen your belt as Megan Arkinstall reveals the most finger-lickin’ dishes in America’s Deep South. “Here we lick our fingers, and if we’re quick enough, we’ll lick our neighbours too,” says Big Kev, an accurately named chef from New Orleans School of Cooking when describing Southerners’ shared love of food. Extending beyond its world-renowned fried chicken, the cuisine of America’s Deep South is unique and fun with a long history. Here, a list of must-taste dishes that y’all need to know about. The official state doughnut of Louisiana, beignets were brought here by French settlers and are found everywhere in the French Quarter of New Orleans. Louisiana has long been associated with spicy food, which has been linked to African slaves who spread their affinity for well-seasoned dishes and also the state’s connection with the Caribbean islands that are also attuned to a peppery cuisine. And when it’s not peppery enough? Add some hot sauce! You can find a dazzling range of sauces across the state – the most famous, of course, is Tabasco. Made from fiery hot tabasco pepper, this spicy condiment is found on tabletops around the country and has even been included in the USA’s military rations since the Vietnam War. 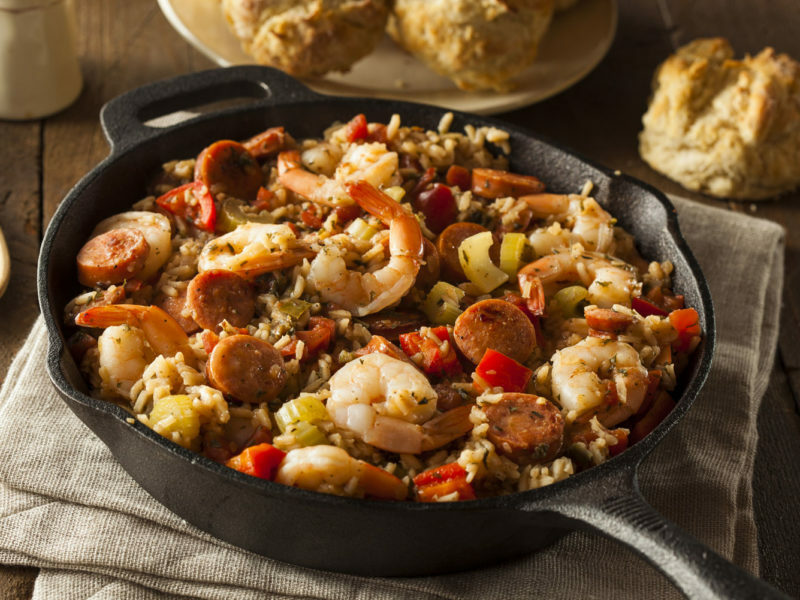 The Deep South version of a paella, this popular rice-based dish contains an assortment of meats including chicken, sausage and/or seafood, vegetables, and a generous amount of flavours and spices. The dish was born out of necessity in New Orleans because it is inexpensive and can be made using a bit of everything. There’s a debate about whether this hearty dish is Creole or Cajun, when in fact there are both versions, the main difference is the use of tomatoes (Creole with and Cajun without), but both include what is known as the ‘holy trinity’ – bell pepper, onion and celery. It is believed that its name comes from ‘jambon’, the French word for ham, and ‘aya’, the West African word for rice. Sacred to Louisianans and again from New Orleans, this roux-based seafood stew is another point of contention between the Creoles and the Cajuns, and can sometimes be confused with jambalaya, but it’s more of a soup and usually thinner than the aforementioned rice-based dish. The most popular version of this stew is seafood but the chicken and sausage version is also delicious. Galatoire’s in the French Quarter has been serving traditional Gumbo for more than 100 years, so definitely worth putting on a jacket (there’s a dress code) and checking it out. Our hosts in Muscle Shoals, Alabama, were shocked when we admitted that we didn’t know what chocolate gravy is – “our grandmothers made it, their grandmothers made it!” – and so, subsequently ordered three servings of chocolate-gravy smothered biscuits (savoury bread, similar to a scone) for our breakfast. Sometimes called ‘Soppin Chocolate’, the exact origins of this roux-thickened sweet sauce are unknown, though it is believed it infiltrated to the Deep South from the Spanish colonies of the east coast. Doesn’t sound very appetising, does it? This classic southern staple is made of ground dried and hulled corn kernels, baked, boiled or fried and usually served as a breakfast porridge or as a side dish to fried chicken. It resembles polenta and you could eat it plain, but the best way is with cheese and salt. Although of Native American origin, the word grits comes from the Old English word meaning ‘coarse meal’ and is most popular in the area stretching from Texas to Virginia, also known as the Grits Belt. Not the type of barbecue Australians are used to, the American barbecue is more about slow cooking (or smoking) in a pit than grilling; it has been around for centuries when cooks would need to slow cook tough cuts of meat. Many Deep South regions have adapted their own style, but the four main barbecuing regions are the Carolinas, where pork is the preferred meat, Memphis which is known for its sweet barbecues, Kansas City where they cook ribs, and Texans who love beef – in particular brisket, which is best slow cooked. Along with fried chicken and corn bread (sweet bread, another staple in the south), barbecues are described as ‘Soul Food’ in the Deep South. Part of the cabbage family, collard greens are the official vegetable of South Carolina. The use of collard greens in the south became prevalent with African–American slaves who were given the leftover leafy green vegetable to cook, usually with ham hock and pig’s feet. These days Collard Greens are a staple across the south, either served with ham or boiled and served as a side dish – a nutritious accompaniment to the much-loved fried dishes of the south. Similar to a Subway, this sandwich was created in 1929 during a New Orleans streetcar strike. Spending months on the picket line with no pay, former streetcar operators vowed to help the strikers by serving them sandwiches free of charge – they called them Poor Boys. Po’ boys are made with crusty French bread that the Martin brothers developed with local baker John Gendusa, filled with meat (usually roast beef, fried seafood, chicken, even ’gator) and salad. How would you like your catfish? Deep fried, fried or deep fried? Catfish is the most commonly eaten fish in the United States and is savoured for all meals of the day (even for breakfast, yes siree). This much-loved seafood dish has its own annual commemorative day declared by President Ronald Reagan in 1987 (25 June, in case you’re around to celebrate), an annual World Catfish Festival, held in Belzoni, Mississippi, and many a catfish-themed restaurant around the Deep South. The meat is denser and less flaky than other white fish. Once upon a time women in New Orleans would have to do laundry by hand, boiling the clothing and using a crank and wringer (thank god for washing machines, eh?). This was usually done on a Monday, and therefore these women didn’t really have time to prepare dinner. And so Monday became red beans and rice day in New Orleans, because the beans practically cook themselves when left on simmer. Traditionally this was all the dish comprised of, but if you’re feeling adventurous (and your washing is all under control) you can add some smoked sausage or ham hock. My oh my, so much pie! Every restaurant we visited in the Deep South had pie on the menu, from key lime to banana cream to pecan, but one particular pie you will find in most places is the Moon Pie, which aren’t really pies but chocolate-covered marshmallows on graham crackers. Created in 1929 at a bakery in Chattanooga, Tennessee, the original Moon Pie is available as a packaged sweet, but many cafes and restaurants serve variations. Our favourite would have to be at 5th & Taylor, an American restaurant in Nashville, whose Elvis Moon Pie, is made up of all his favourite things: caramelised bacon, banana, cream, pecan, peanut brittle, chocolate and graham crackers. Think we’ve missed a Deep South culinary classic? Let us know below! You missed the slugburger, a treat here in northeast Mississippi!